The Enterprise Command Station, the user interface, displays your Enterprise’s situation exactly the way you want it. You can see your surveillance video, graphical displays of your operation, see the location of activity on maps, and get advised of events as they occur. It synchronizes the information displayed so that all of the information relevant to your operation and actions are always presented the way you want, in real time, and in synch. When you need to intervene, just right-click on a map location, a graphical image, a surveillance view, or the report of an event to control the operation. This is the power of the of the Enterprise Command Station (ECS), the desktop of EnterpriseSMS®. The many components of the Enterprise Command Station fall into two categories: the presentation interfaces and the commands interface. Enterprise Command Stations may be distributed anywhere and individually configured to meet the mission requirements at each location. The presentation interfaces are the part of the desktop that present the complete, real time view of the state of your Enterprise. 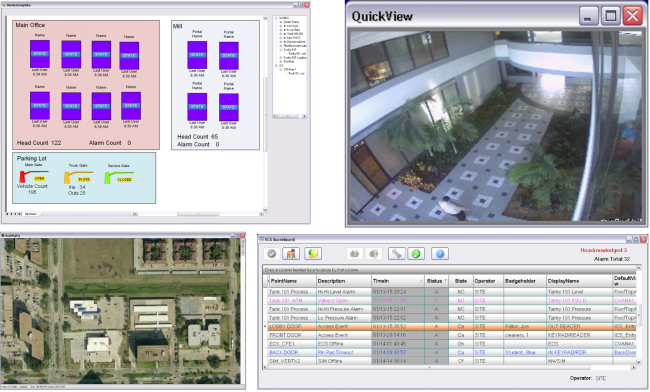 They provide the complete situational awareness of all of your Enterprise’s activities. There are four basic presentation window types: windows that present information (called “information” windows), windows that presents surveillance video (called “monitor ” windows), windows that presents diagrams of the state and behavior of your operation (called “graphics” windows), and windows that present geographical views of your enterprise (called “maps” windows). The ECS keeps all of the information displayed in synch, preventing conflicting screens and dangerous operational mistakes. Compatible with your own applications and your custom work screens, this powerful station enables a single desktop to deliver a complete view of your Enterprise with a complete audit trail of historical events. Desktop layouts may be customized to meet the job requirements of the assigned operator. They may be adapted to meet any particular mission and information format needed. Once designed, their windows may be individually locked into place or allowed flexibility according to need and policy. Access to information, surveillance views, graphics, and activity may also be controlled so that operators may only see or interact with the system components and capabilities their specific assignment requires. These capabilities are configured by tools provided with the Enterprise Command Station. All configurations are retained in the master configuration database so that loss of a station does not require complete reconstruction. 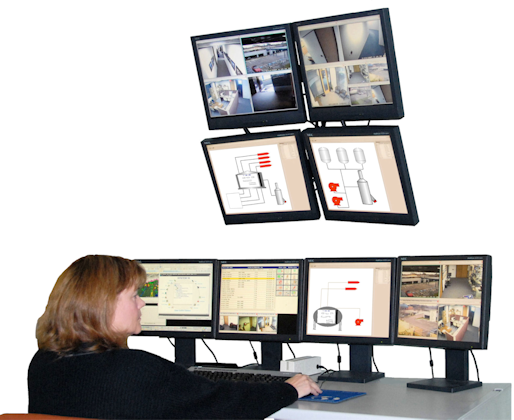 When a command station is reconstructed, it reacquires its configuration information as it was configured at the time of the system failures. Copyright (c) 2012 Integrated Command Software, Inc.